The Interconnecting Cisco Networking Devices Part 1 (ICND1) is the exam associated with the Cisco Certified Entry Network Technician certification and a tangible first step in achieving the Cisco Certified Network Associate certification. Candidates can prepare for this exam by taking the Interconnecting Cisco Networking Devices Part 1 (ICND1) course. This exam tests a candidate's knowledge and skills required to successfully install, operate, and troubleshoot a small branch office network. 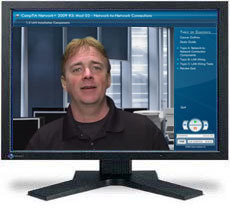 The exam includes topics on networking fundamentals; connecting to a WAN; basic security and wireless concepts; routing and switching fundamentals; the TCP/IP and OSI models; IP addressing; WAN technologies; operating and configuring IOS devices; configuring RIPv2, static and default routing; implementing NAT and DHCP; and configuring simple networks. This course strictly covers all the Cisco CCNA ICND1 Exam objectives.